"Breaded and deep fried beef cutlets are known as chicken fried steak because of the similarity in cooking method to fried chicken. This is a family recipe that we have used for years. Vegetable oil may be used in place of shortening for frying." Cut top loin crosswise into 4 (4 ounce) cutlets. Using a glancing motion, pound each cutlet thinly with a moistened mallet or the side of a cleaver. In a large, heavy skillet, heat 1/2 inch shortening to 365 degrees F (185 degrees C). While the shortening is heating, prepare cutlets. In a shallow bowl, beat together egg, buttermilk, salt and pepper. In another shallow dish, mix together garlic powder and 1cup flour. Dip cutlets in flour, turning to evenly coat both sides. Dip in egg mixture, coating both sides, then in flour mixture once again. Place cutlets in heated shortening. Cook until golden brown, turning once. Transfer to a plate lined with paper towels. Repeat with remaining cutlets. Drain grease, reserving 1/2 cup. Using the reserved drippings in the pan, prepare gravy over medium heat. Blend in 1/4 cup flour to form a paste. Gradually add milk to desired consistency, stirring constantly. For a thicker gravy add less milk; for a thinner gravy stir in more. Heat through, and season with salt and pepper to taste. 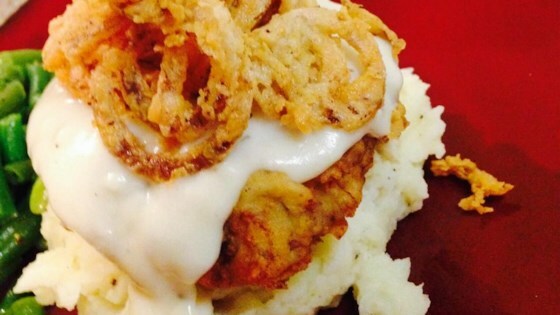 Serve over chicken fried steak. Of all the recipes we have tried from this site, this has been the hands down family favorite!! It takes a few min. to prepare but is definatly worth the wait. the meat was excellant, the gravy had very little flavor. Tasted great! Not the best as a leftover so I recommend not making much extra. This recipe was too much for my husband and I. This makes really good chicken fried steak...the gravy just needed a little extra garlic salt and pepper. Good recipe!